An anonymous donor approached Kendall Park First Aid Squad with a large number of brand new books and stuffed toys and requested us to donate the same to appropriate. Deputy Chief Lance Eisen and Captain Kara Eisen collected those books and donated around 600 books to The Bristol Meyers Squibb Children’s Hospital. 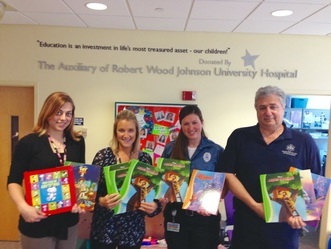 These books and stuffed animals were distributed to the children in the hospital. This entry was posted in KPFARS. Bookmark the permalink.